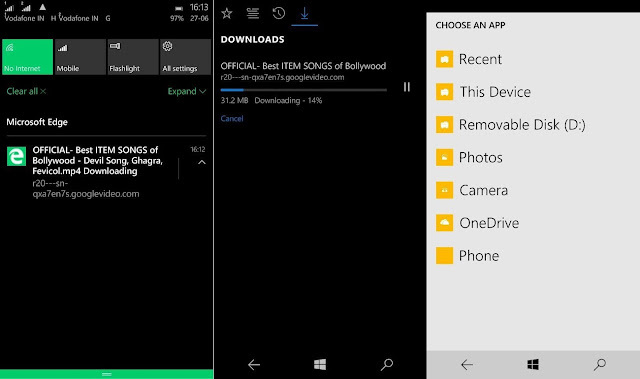 With Windows 10 Mobile Build 10149 Microsoft added many improvements to Microsoft Edge. Yes now the branding is correct Its called 'Microsoft Edge' not 'project spartan' the name is changed in all around the OS. As the name of the app is changed all the data stored in Spartan while you are on earlier build will not be transferred to Edge. All your favorites passwords bookmarks everything will be lost. Microsoft has added support for Desktop version in this Build. It makes easier for browsing desktop webpages easily. So to get better idea how much difference is there between Desktop and Mobile versions We ran some HTML5 tests and here are the scores. The desktop version got 402 out of 555 and mobile version got 401 out of 555. Then we found that Edge on PC too scores the same score of 402 out of 555. 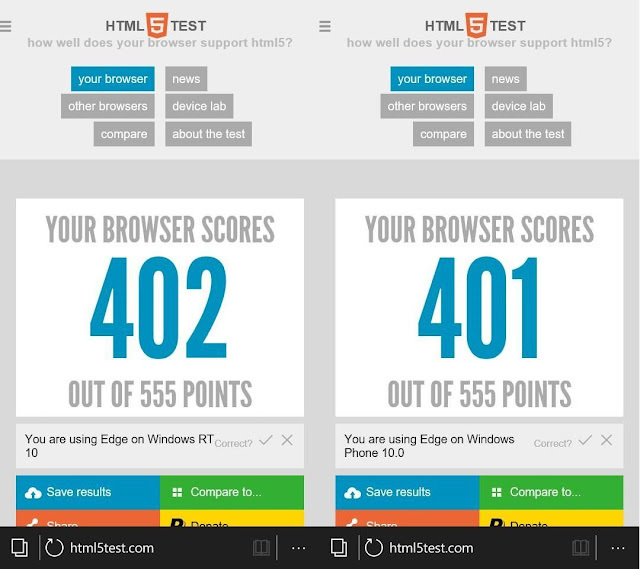 Which means you will get the same HTML5 experience on Both PC and Mobile using Edge. And also to our surprise the test recognised OS as Windows RT 10. 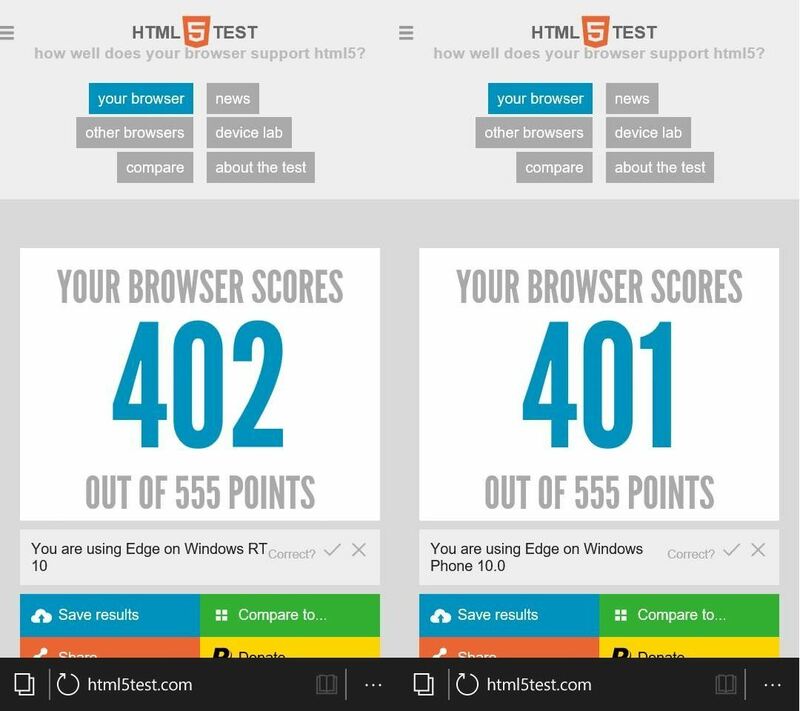 Internet Explorer 11 in Windows Phone 8.1 scores just 346. Even UC browser scores 344 in the tests. 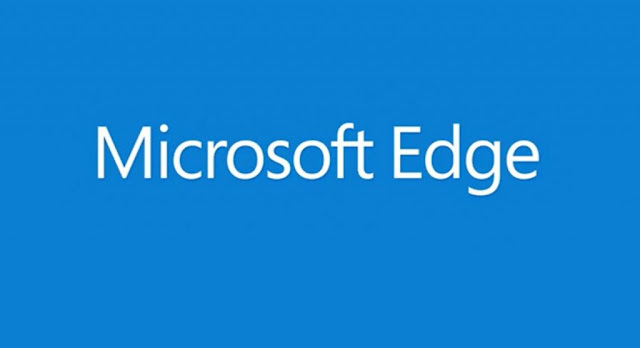 From this itself you can say edge is having lots of improvements over Internet explorer. Being Curious I wanted to test live video streaming on Microsoft edge and attempted to play a youtube stream while in Mobile version it said not supported. But it played in desktop version. And now I can watch live cricket matches on Youtube or Starsports.com right from my Mobile. It is awesome. In the desktop version it took some time to load but the stream works like a charm once loaded. Another neat feature added in this build is background downloading. Unlike Internet Explorer edge has a separate downloads section and also supports background downloading. You will get notifications while a download is started, ended or failed due to some reason. You can check download status by going to hub. The download will go on as long as the browser is in foreground and background. But all the download data will be lost if you close browser from task view. One more awesome feature I have noticed is the updated File picker. Now its easier to upload any file. When I tried to upload image online via Edge I have seen this. As you can see in the list you also get Camera to let you take pictures directly and upload. If you don't have file stored on your device you can pick it from onedrive too. You can even upload recently viewed files. Yet I have not seen the same file picker in Windows phone 8.1 apps seems like it's a different API, was only available on edge for now. With all this new improvements you will automatically get a doubt about what about RAM usage while doing a background download? Folks at msmobile.pl too got the same doubt. 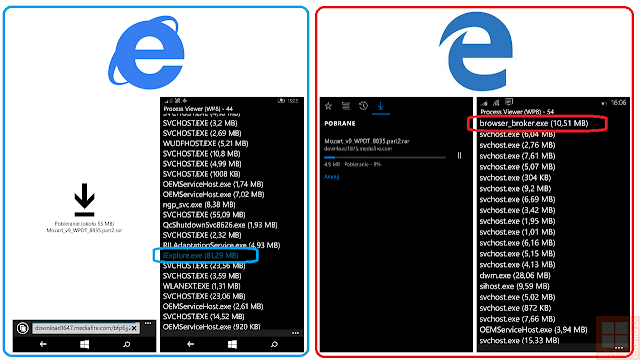 and they decided to test the RAM usage while downloading on IE11 and Edge and compared both while downloading same zip file. IE11 used 81.29 MB while Edge used just 10.51MB of RAM. Which is remarkable. thanks to msmobile.pl now we know edge handles RAM better than IE 11. Now has Special Desktop version to let you browse desktop pages easily. Overall the performance is great. The UI is awesome . I seen couple of glitches here and there but not major issues. Most of them are display bugs. Sometimes when I change orientation from portrait to landscape only half of the screen is filled one more notable thing is that some of the Icons are getting displaced. Anyway Microsoft edge is still in Beta stage, even the OS is in beta. Still it came a lot further from its predecessor, it's not quite as good yet. I hope microsoft will be updating edge frequently with much more improvements and features.